Cindy: You're sure it was here? Cindy: That we were to wait. Mindy: He said by the invisible chair. (pause) Do you see any others? Cindy: No, but I wouldn't. If they were invisible. Cindy: He should be here. Mindy: He didn't say for sure he'd come. Cindy: And if he doesn't come? Mindy: We'll come back tomorrow. Cindy: And then the day after tomorrow. Mindy: Day after tomorrow I have a hairdresser's appointment. Cindy: Then Thursday, then. Thursday good for you? Today's pattern is available from Jen at MOMSPatterns — it's so cute, isn't it? You are FUNNY. Im a lurker on your blog. 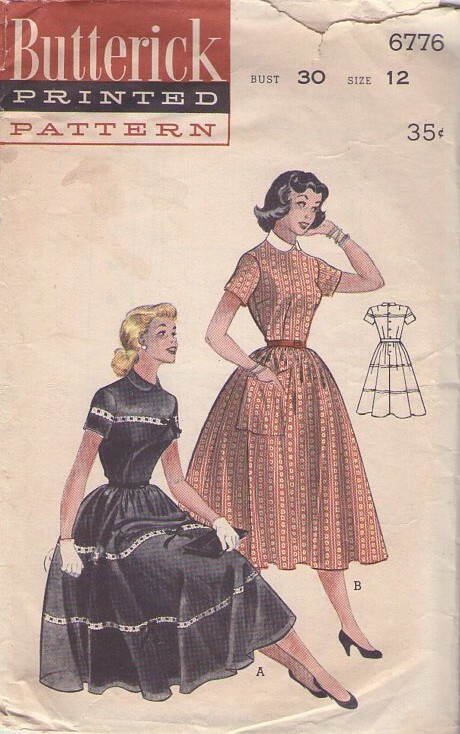 you inspired me recently to track down your simplicity duro pattern on ebay. I hope mine turns out as great as yours. Id settle for half as great though. thatd be good. Patterns of the Absurd. I knew my college education would pay off someday! Love it! Beckett never would have understood the importance of being well-coiffed. You just combined two of my favourite things in the world. My day has been made. Waiting for Godet? ;-)Sorry – bad and obvious pun . . . I love your stories…thank you so much for sharing them with us all. Oh. To of lived in an era when you would never go out (even to the market) without perfect lipstick, hair, dress, and of course gloves! I am vanquished by envy.This pattern is so cute. Finally I have found a great writer, and she writes about something I care about more than a little, and she does it most every day. YAY!